Over the past decade, stereotypes that video games were a popular medium intended only for youths have been eroded. It is clear that video games are also a popular medium for adults. The rapid growth of ever-older audiences playing games on mobile phones and on consoles has been brought about by easier and more intuitive user interfaces, repeated stories about the health benefits of play for older players as well as demography. The average age of Australians who play video games is now 33 years. They play for an hour-and-a-half, and between three and four times a day. Video games are played by 49% of those over 50 years of age and 39% of those over 65: primarily, they say, to keep their mind active. These are the latest results from a series of studies I have conducted since 2005 for the Interactive Games and Entertainment Association. The report entitled Digital Australia 2016 is the sixth iteration of empirical studies about demographics, self-report behaviours and attitudes around digital games. The current research is based on 1,274 households and 3,398 individuals of all ages living in those households. Adult participants responded to 80 questions about themselves and on behalf of all members of their households. Participants were drawn from an online national sample using the Nielsen Your Voice panel in May. In the current study, age bands used by the Australian Bureau of Statistics were mapped onto player status. The operational definition of a player was any person in the household, self or participant-reported, for whom the answer was simply "yes" to "Do you…" and "Does [household member]… play computer or video games on any device including a PC, console, handheld, social network, mobile phone or tablet computer?" The result reveals that 68% of the Australian population plays, although the proportion varies by age group. Predictably, 91% of children aged five to 14 play. However, the proportion of older adults aged 65 and over who play is as great as young children between ages of one and four. Women and girls play for 75 minutes a day on average, while men and boys play for 100 minutes on average. Casual play is nearly identical for females and males at 25 minutes a day. However, males spend considerably more time on in-depth play than females: 75 minutes a day compared with 50 minutes on average. Playing is heaviest in the late teens and early twenties. 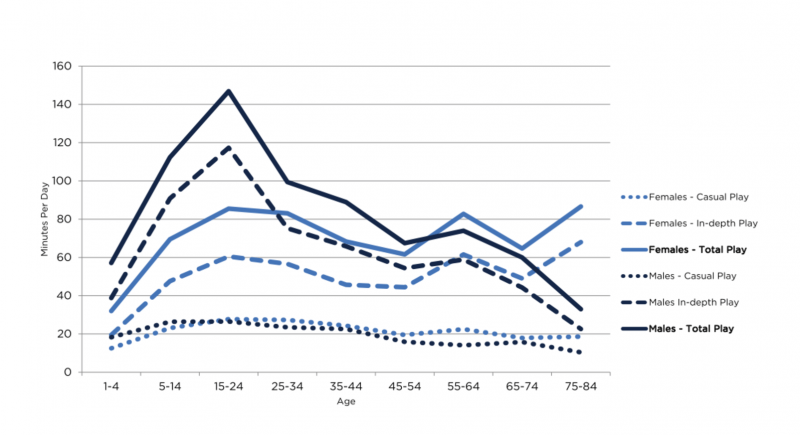 Young people spend the most time gaming, but older Australians are playing too. Adapting a model of motivations for media use called uses and gratifications, survey participants responded to questions about why they play. Naturally, having fun and filling in time to alleviate boredom top the uses and gratifications list of most players. However, drilling down by age group produces a compelling if simple finding: for those aged 50 years and over, fun is replaced by keeping the mind active as the main reason for playing. Participants were also asked to nominate whether "positive ageing" benefits might be realised by older Australians playing video games: 76% said they felt video games could increase mental stimulation, 61% said they may help fight dementia, 55% said they could help maintain social connections. When asked about general health benefits of game play, participants nominated improved thinking skills first, followed by coordination and dexterity. Despite limited evidence for games improving thinking skills in short-term studies, longitudinal evidence will likely emerge in coming years as big data from many "brain games" comes to light. Results of this survey research are limited. Nevertheless, I believe they suggest games are transforming as a medium. While games will continue to be played for entertainment by players of all ages, they will increasingly serve other purposes. Interest continues to grow for the potential of games to reinvigorate education, enhance workplace training, and stimulate social and political conversation. I see games changing most in response to an ageing population. We live longer on average today than at any other time in human history. According to the ABS, the median age of Australians today is 37 years, and a third of Australians are aged 50 years or more – extraordinary as it sounds, 33% of Australians are over the age of 50. Within 20 years, the median age will be 39 years on mid-band predictions from the ABS. By 2035, 20% of the population will be 65 years or older and nearly 40% will aged 50 years or older. As Treasury's 2015 Intergenerational Report argues, working life will be extended in coming years because human life has been extended dramatically in the past century. However, the skills needed and the inclusion required for older workers will centre on knowledge worker literacies, including those of interactive digital media. I believe older adults are up to the challenge. Longevity is a result of innovation and technology: for people and for media. The review of funding and the Australian games development industry championed by Senator Scott Ludlam is propitious in this regard. Why shouldn't Australia lead the charge on designing more games for more audiences and to innovate particularly around serious games for our seriously ageing population?